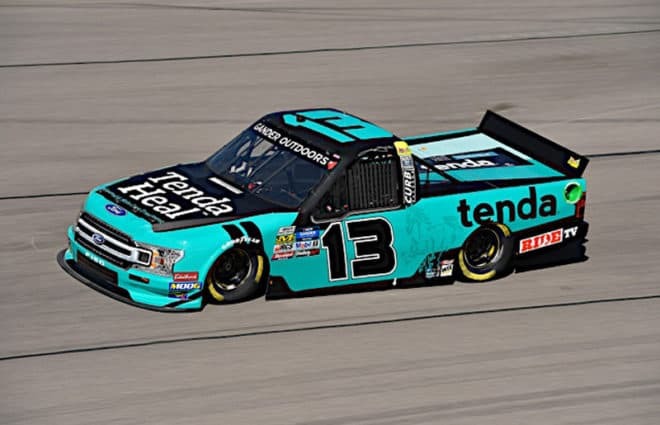 Johnny Sauter’s a former champion, one of the longest-tenured drivers in the NASCAR Gander Outdoors Truck Series. He was in last November’s Championship 4, competing for a season title after another successful year. And yet… he spent much of the offseason without a ride. That was until Sauter’s old stomping grounds, ThorSport Racing, came calling. 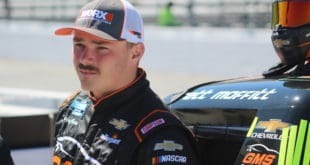 After being replaced at GMS Racing by defending champion Brett Moffitt, a seat with the Sandusky, Ohio race team opened up, and Sauter was the only man to fill the void. 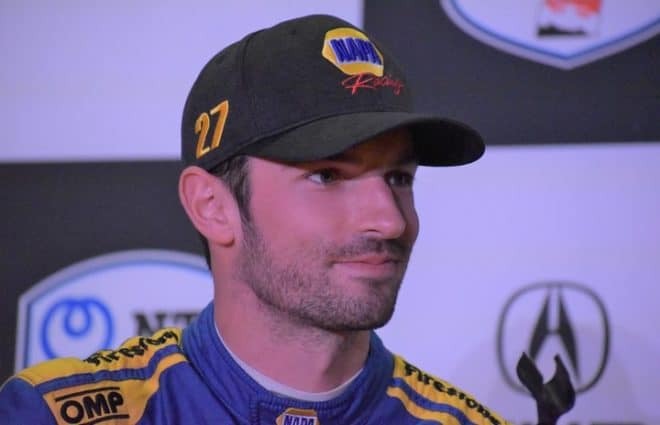 Frontstretch’s Davey Segal caught up with the Necedah, Wisconson native at Las Vegas Motor Speedway for a wide-ranging conversation. 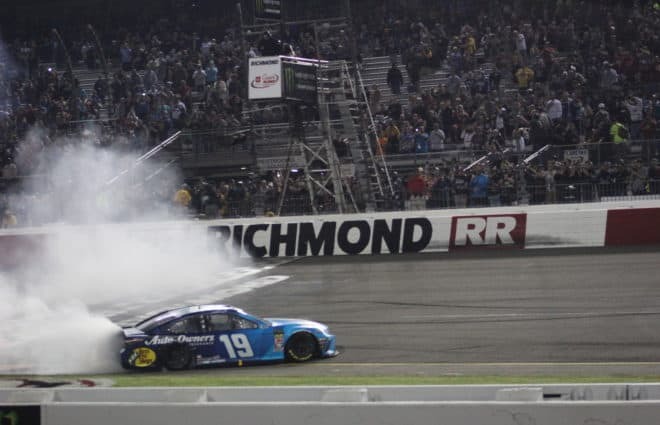 Davey Segal, Frontstretch: How’s it been getting re-acclimated with ThorSport Racing? Johnny Sauter: Honestly, it’s been awesome. I still remember the first day I walked in the shop. You see some familiar faces, and some new faces too. I always felt like we had some unfinished business at ThorSport, I just thank Duke and Rhonda (Thorson) for bringing me back. Hopefully we can make good on it, win some races and try to win a championship. Segal: You had one of the more unique offseasons in recent memory. Lay out the timeline for us when you figured out you were out of a ride and when you realized you found one. Sauter: Obviously, it was kind of a surprise, I guess. It was January 10 or somewhere around that neighborhood. They [GMS Racing] basically just told me they wanted to do something different. The ThorSport thing came together pretty quick after that. I’m lucky to even have an opportunity, honestly; that’s how I feel about it. And we’re going to make damn good on that opportunity. That’s business sometimes and that’s the world of racing. Peaks and valleys. I feel great about it, you know? I couldn’t ask for a greater opportunity to come back and it’s going to be a lot of fun. I already feel it. Segal: Do you feel slighted at all by GMS Racing? Sauter: I have [no animosity], honestly. This here for me is probably a better opportunity. It’s good, I live in Wisconsin, it’s a little closer to home. You want to go to the shop, hang out, do all those things. Duke and Rhonda have been nothing but great to me. We’ve got a couple guys on this team that were with me when I was there the last time. It’s a good deal. You get caught up in emotion or whatever and you’re worried about animosity, like you said. I don’t care for that stuff. It don’t matter. I’m onto the next phase, and that’s trying to win races in the No. 13. Segal: Do you feel like you have something to prove now? Sauter: I always feel like I have something to prove. It doesn’t matter if I’ve won six races or I’ve won no races. I’m the kind of guy that always carries that with him no matter what. I’m pretty self motivated, I guess. I just want to win races for me and for everybody. I don’t know if I can be motivated any more [than I already am]. I always give it my best. Segal: There’s a lot of turnover in the Truck Series. Do you feel like something needs to be changed to assure veterans like you in the series have security in their jobs? Sauter: I don’t know that anything can be done, quite frankly. At the end of the day, there’s team owners and hey decide who drives their stuff. That’s their choice and their deal. How you would ever control that, I don’t think that’s even realistic. You’re just thankful you know people like Duke and there’s guys out there that appreciate your experiences and all that. And want you to try to win races for them. Segal: Was there a moment when you thought you’d be taking some time off or retiring? 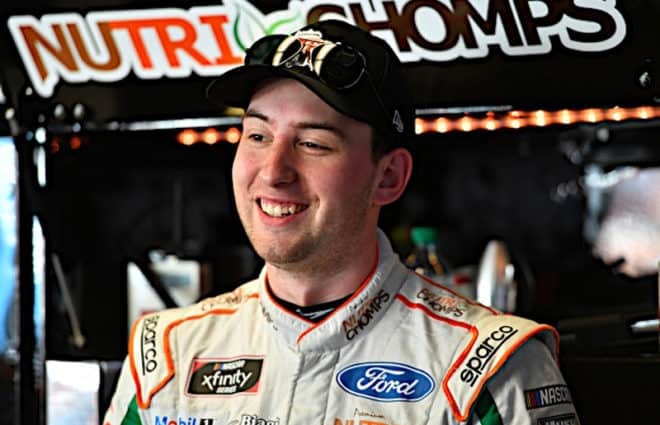 Sauter: I definitely feel like I do but then obviously, my first conversation with Duke, I felt pretty confident of doing something over here. Having said that, I didn’t feel like I was on the sidelines very long. Last week was a big shot in the arm with a good run. Winning races is the ultimate, there’s a lot of satisfaction in that. The first time we pull into Victory Lane in the No. 13 truck, it’s going to be pretty awesome. Segal: You came from a title-contending team. And this is a championship-caliber team, too. Sauter: For sure, when you look at the Truck Series there’s ThorSport and a couple others (teams that can win). You want to be aligned with those if you want to go to the racetrack and be competitive week in and week out. We came so close to winning a championship with ThorSport six or eight years ago, whatever it was. That still kind of burns a little bit. The goal is to win races, No. 1, like I said and then a championship. As a driver, at least for me, I don’t know if I speak for everybody, you just want to know you have the opportunity to win week in and week out. And I have that. Segal: You last went full-time Cup racing in 2007. What do you remember about those days? Sauter: It was a long year. I was with a start-up team. Basically, a team that had one car and wanted to add a second one. I remember the first five races going to those without points. At that time in 2007, there were like 45 or 50 cars showing up every week. We knew we had to make it in on speed. Back then, qualifying was pretty nerve-racking. We had some success that year. We ran fifth in the All-Star race and ran in the top 10 some, ran really good at some tracks. It was a good year but honestly it was quote awhile ago. My memory is pretty shot. Segal: You have no itch to come back though, do you? Sauter: Nah, not at all. I’ve got four kids and my wife. I like being able to do things with them. The Cup schedule is very demanding. Do I think I could do it? Absolutely. But it’s one of those deals where I like having the opportunity to be competitive week in and week out… there are only so many seats over there to be able to do that. I’m very, very content where I’m at. Segal: You’ve lived in Wisconsin, away from the hub in Charlotte, but also lived in the 704. Was it difficult being away from everything? Sauter: I did both. I lived in Charlotte for awhile. But my kids started to get a little older, and I said if I’m not going to race, I’m not going to live in Charlotte, North Carolina, I can tell you that. It was good to get home. I’m a Wisconsin guy, through and through. I love being there. I think in a lot of ways, some of the best years of my career have been since I’m away from the fray, so to speak. Sometimes, it’s nice to get away from it. I know what I need to do when I get to the racetrack. It’s hard Monday, Tuesday whatever when you go to lunch, all people want to do is talk racing and stuff. Segal: There’s just less distractions…. Sauter: It is, and you get all week to get geared up to go to the racetrack. It keeps you fun and pumped up. Segal: Do any of these young guys in the Truck Series ask you for advice? Sauter: Not so much about career advice but they do call and ask you about certain racetracks. Or they come to you after practice and they say “Hey, what did you think here? 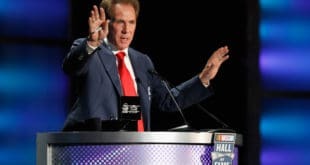 What did you see here?” Obviously, I’ve been on teams where you have rookie drivers, too, so I’ve had that environment of working with a guy that’s quite frankly never been here before. I have no problem doing that, I had plenty of people help me when I was getting started on my career. If I can help people, then great and if I can’t, that’s fine too. Segal: What do you think realistic expectations are for this season at ThorSport? Sauter: The way we’ve fired off here I feel like we should be able to win races, No. 1. How many that is remains to be seen, but I really feel like we are a title-contending program. We got a really good group of guys, our pit stops have been really good, we have Ford Performance support; we just gotta put it together. Being new, we might have a stumble here or there. [But] being new, I really feel like we’ve hit the ground running. Segal: How’s working with Joe Shear Jr. been? Sauter: It’s been good. He’s kind of been there throughout the years and we’ve had some success. Obviously, it takes more than two guys, it takes a whole group of people. ThorSport has grown a lot in regards to how the shop is set up, how it operates on a day-by-day basis. That’s the stuff I think about to kind of gauge where I feel like we are. It’s pretty powerful stuff. I feel like having Joe is an asset for sure. Working with my teammates, Crafton, Enfinger, Rhodes and Snider, we got a lot of experience and we have to utilize that. 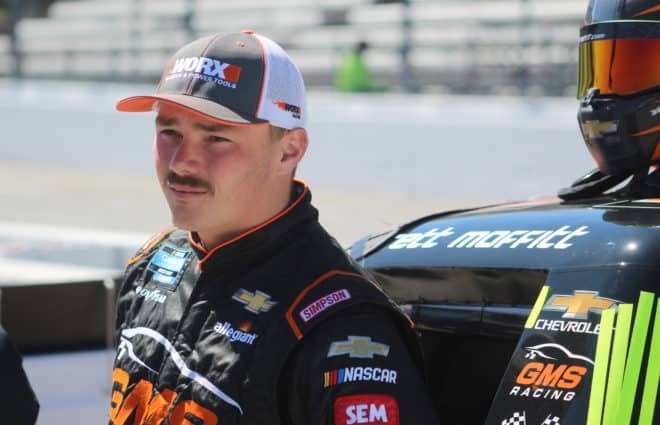 Segal: There’s another young driver from Wisconsin in Derek Kraus working his way up through the ranks, competing in the K&N Pro Series West right now. Have you two linked up at all? Sauter: I see him more at late model races more than anything. I raced against his dad but I’ve only talked to Derek a couple times. It’s kind of funny, you feel like you’re the young guy, and then your career goes on and you find yourself at 40 and there’s younger guys coming along. 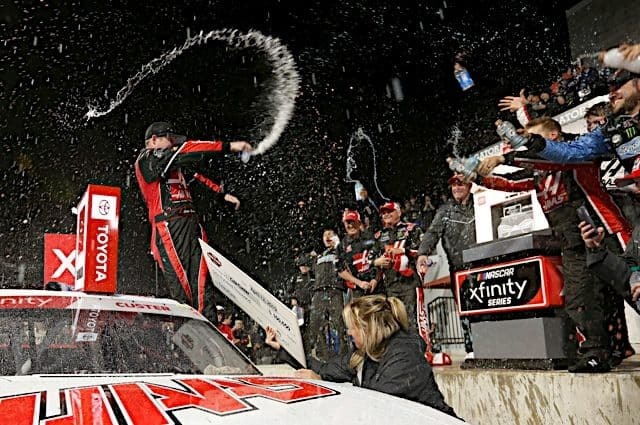 He’s obviously had some success in the K&N deal, so that’s good for him. Segal: I have to ask. Being a Wisconsin guy, what’s your go-to cheese? Sauter: You can have any kind you want. A lot of people like cheese curds. They’re pretty accessible, you can buy them at any gas station or convenience store. Personally, my favorite is Muenster cheese. 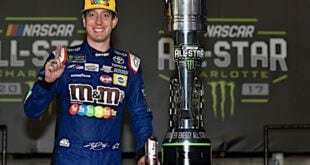 Previous NASCAR Mailbox: Which Non-Playoff Driver in 2018 Has the Best Chance of Making it in 2019?